Some people say that the best way to make decisions is to “trust your gut.” As political advice goes, we can do a lot worse. However, the danger for Venezuelans of both clans is that our gut is frequently wrong. As we face a rash of political persecution, now is a good time for a gut-check of our guttural instincts. We haven’t really talked much on the blog about the heightened persecution of political leaders. From the outrageous jailing of Leopoldo López, to the moves against elected officials such as Enzo Scarano and Daniel Ceballos, to the recent attack on Maria Corina Machado, whatever notion that authoritarianism was being contained has been swept away by the tsunami of repression emanating from downtown Caracas. The status quo in Venezuela is that nobody is too hot to mess with, and nothing the Maduro government does can surprise us anymore. With that in mind, what can we do? What can we say that hasn’t been already said? Remind people that Daniel Ceballos was elected mayor with more than 60% of the vote, and that Scarano won with more than 70%? That Leopoldo López is a political prisoner? That would be trite. The interesting aspect of all of this is not that it happens, but how we choose to react. When faced with these events, it turns out that there is something we can do: think. These moves by the government are deliberate. When they jail Leopoldo, they are not going after him – they are after us. In particular, they are looking for a reaction that serves their long-term goal. Take, for example, the Ceballos case. 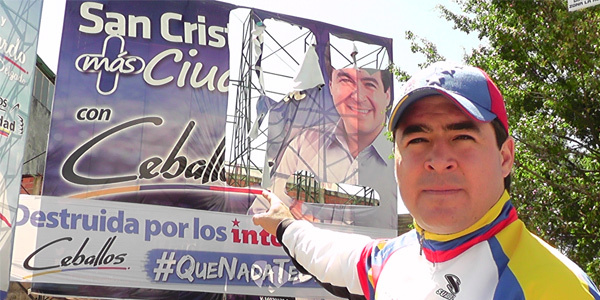 Mr. Ceballos is not being jailed in order to quench the protests – if that were the case, San Cristóbal would be Sabaneta by now. He is also not being jailed because of a particular vendetta from someone in the government. No, Mr. Ceballos is being jailed in order to break our spirits, make the protests continue, and to steer us on a particular path. He is also being jailed so they can steal the San Cristóbal mayor’s office. That reaction is legitimate, and it is exactly the one the government is looking for. They want a repeat of 2002-2004, they want to force us into supporting coups, strikes, and walking out of elections. That is why we should go against our gut and do the exact opposite. Sitting out the replacement election, as some have suggested, would be a massive mistake, similar to the one we made in 2005. Not only would we be betraying the thousands of gochos battling out in the streets, we would be giving away a prominent political office that is ours to begin with, and that will most likely remain ours. The government simply cannot win the mayorship of San Cristóbal – and nothing they do can change that. The same holds true for San Diego. Not participating would mean letting them off easy. I understand all those who think the deck is too stacked against us. I empathize with those that say voting in these circumstances is akin to “legitimizing” a dictatorship. I get it. But still, we need to think long term. The best thing for Ceballos, for Scarano, for Leopoldo, is to go out and vote whenever we can. Do it with a handkerchief on your nose, but do it anyway. Don’t trust your instincts on this one.